Thank you for giving me a second chance in life. Before surgery I was suffering so much my patients were telling me that I needed physical therapy. Because of your care, I feel great! Thank you so much for dealing with my anxiety and crazy thoughts. Being a physical therapist, my mind is dangerous. It’s like what you said, I cannot enjoy life if I keep assessing myself. Again, thank you so much of your care. It is rare to have an amazing surgeon like you! Please let Saloni and the rest of the tam know how thankful I am! This morning I woke up with no tingling or pain down my left side; even my arthritis seemed to have calmed down. It is such an amazing feeling to be free of the pain that has been my more or less constant companion over the last year! THANK YOU!!! I haven't even needed the pain meds or muscle relaxants – I am just using Tylenol and ice packs. I have some soreness around the surgical site, some acid reflux (I assume from the tube down my throat) – but otherwise I feel great. I thought I would be in bed today, all doped up, and instead I went for a wonderful walk with my sister. I promise that I will follow your orders and not lift things more than five pounds. And thanks for the swag bag! But above all, Dr. Hunt, thank you for your miraculous work and for lifting this burden from me! I am so grateful. Woke up feeling great. Very minimal discomfort (no pain - no need for Norco). Taking Advil and ice pack regimen. I will rest and take it easy. Appreciate you saving my life once again! I’m sitting here on a Sunday morning enjoying every moment thinking how I would have felt this whole weekend had you not rescued me from the misery I had been in. I think for the last month I have experienced Hell (I will be very good from now on so I do not return there in the afterlife...). Having described how I had been feeling in the last month you can understand the depth of my gratitude. To you. Everyone thought me crazy for contacting a Dr on Wednesday and expecting him to perform surgery on a Friday - you proved that there are such Angels. Thanks a million, I will always remember what you have done for me. By the way, I have no pain at all and I’ve been very careful to follow your instructions perfectly. A nurse is coming to inspect the wound today, I’m sure it’s healing well. All the best to you, may you continue doing for patients the kind deeds that are very uncommon. Dr Hunt — I just wanted you to know that in 10 years I have never been one whole day pain free and in the last few weeks I have experienced this amazing phenomena multiple times in a row. I had forgotten what it was like to live normally and I feel like I’m finally gaining control of my life again — all thanks to you. So incredibly grateful! I cannot thank you enough. You are truly a life saver!!! I cannot allow for more time to pass without acknowledging my appreciation for the care and service given to me, received from Dr. Hunt. I had spinal surgery once before while in Boston from an icon in the profession. I can honestly say my experience with Dr. Hunt was indeed the best. Thank you for your top rated professionals. It’s with great pleasure and sincerity that I take the time to send this email about a remarkable surgeon at Cedars Sinai, Dr. Leonel Hunt. I have suffered from chronic back pain for at least eight years. Each year my pain had worsened. Last year, I was at the point in my life where I could not stand for more than two minutes, couldn’t cook, walk two blocks, sweep, lift, or endure any type of weight bearing. At the time, I worked for CSMNS on LeDoux in the Training Department and couldn’t catch the shuttle to and from my office and the towers. The fact that there were no seats at the LeDoux pickup or the towers while waiting for the shuttle, totally eliminated that form of commuting for me. Therefore, I had to incur the expenses of paying for parking each time I had a meeting or training class at the towers. I was always cranky and snappy due to constant pain. My work and quality of life was diminishing drastically. During my stay at Cedars-Sinai hospital, he stopped and checked on me frequently and his kind and humorous nature eliminated any doubts that I had in my mind. I’ve made a full recovery from the surgery and my life has definitely changed for the better. I feel like my old self again and couldn’t be more grateful for the caring doctor who I feel changed my entire life. I’m constantly bragging about Dr. Hunt to everyone! My incisions are seamless! My quality of life improved drastically and I couldn’t be happier with my surgical decision! I was recently hit from behind on the 405 and experiencing some pains in my lower back while standing and neck pain. However, I know that if I did not have the miraculous surgery by Dr. Hunt prior to this accident, I probably would not be able to walk today from pain. I feel that Dr. Hunt has been my life saver and I will be forever grateful for the professional, kind, and nurturing care that he provided me. I wanted to share this letter with all attached just to let you know what a wonderful colleague you are working with at Cedars-Sinai. Today is the 9th anniversary of the day you changed my life. Thanks for making my life so much easier. Despite whatever happens in the future, you and your respective skills have served me well by allowing me to “walk” through the last seven years while continuing to advance my career and provide a good life for my family. Thank you both from a grateful old patient. I hope you are well. I have passed my 1 year anniversary of the back surgery and I'm doing great! In fact, my husband & I are expecting a baby in November. We are very excited! I can not thank you enough! You are the best of the best! I feel amazing today! No pain, feeling my leg again No after effects from yesterday! Being smart & taking it very easy for the next four days. Very much appreciate You! 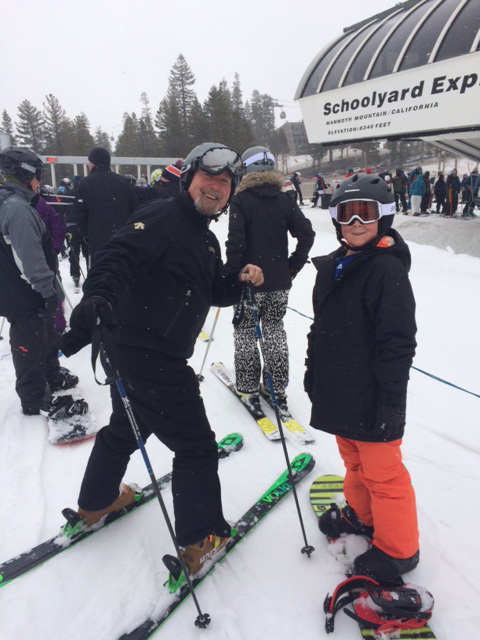 This is me and my Grandson Colton in Mammoth for Spring Break. I can ski thanks to you. I can't thank you enough for the great job you did fixing my back. I still have hope to ski off the top when I turn 70. Thank you for your caring heart and your skilled hands. We appreciate your attention and your bedside humor. May you continue to be blessed with happiness and success. Thank you so much for taking great care of me! Your professionalism and kindness are greatly appreciated! I just wanted to express my appreciation for the opportunity to consult with you. Thanks for the time and the reassurance that I am doing the right therapy, and that the knee problem is really a result of a back problem. I continue to do the aqua therapy, and most days I do well, but I am also aware of certain exercises or activities that results in some knee discomfort, and I am careful not to push when I feel the discomfort. I have dramatically improved since the Kyphoplasty, the Nerve Block, and since your original hospital visit. I continue to work as much as I can, go for chemo, am trying to live as normal a life as possible. Again, thanks so much for your reassurance, have a Happy Holiday Season, my best for the New Year, and if I get in trouble, I will call to schedule an appointment. I hope you are doing well and six years after your great work, I wanted to say thank you. I just wanted to thank you for everything you do for me. Your expertise and bed side manner instill in me the utmost confidence. I would never let another doctor come near me. You have a certain way about you that puts me completely at ease. I can't thank you enough for making me better. You are absolutely the very best, and I thank you from the bottom of my heart ❤. Thank you for having my back and giving me a pain free spinal fusion! You are truly the best and I am forever grateful. Just a quick thank you to you and your staff for getting me all fixed up. Still working on getting back in the full swing of things. Again, appreciate you take the time out to answer all of my questions/concerns. It's the little things that make a difference. I think you know already how grateful I am all you've done to keep in the game. But that talk we had today about work and what you and your brother are doing over in Ethiopia is something I not only respect and admire but it inspires at a time in my life where, what's happened to me physically, has put me at a crossroad. I'm not grieving the job I lost because I'm hoping it might just put me on path toward some higher purpose. The kind of meaningful work you guys are doing over there. Some version of it, anyway. Anyway, that's what I was thinking as you were describing the work you're doing at that hospital. Sorry for the serious disclosure. I know we like to kid each other but I just wanted you to know why I'm grateful for having chosen you as my surgeon all these years. I think everyone in that hospital would back me on that choice. Hello to you and family. I am glad to inform you that Yael is doing well, her appetite is improved, and still she has no back pain. She is trying to take walks outside of the house (around neighborhood as of last). She can sit more than 20-30 minutes. I want to thank you so very much for seeing me and explaining to me my situation and advising me the best direction to take. I am better now and am back to leading a normal life. You are the best. I wanted to let you know how thankful I am for the great work you did. As you can see from the photos attached, I am active and not restricted in any way. After 13 years of living with advanced breast cancer and being in continuous treatment, I can say I still travel and remain a passionate advocate for support services, research funding and life extending treatments for metastatic breast cancer thrivers. Dr. Hunt changed my life. One surgery and ever since I have been a new person without pain. Good morning. Just wanted to touch base with my favorite Dr. Hunt as this is the 3rd year anniversary of a successful fusion! Hope you had a nice holiday weekend and hope all is well. Dear Dr. Hunt, today is the sixth anniversary of your masterful surgery on my back and I am off top play golf. Thanks for making my life so much more enjoyable. Thanks for all you've done with my spine. I have been doing a lot of swimming and a lot of aqua therapy and I seem to have found my niche so thanks again, Doc. You're the best. Heartfelt thanks to you and Gabriel for giving me my life back. You’ve been there for me every step of the way and greatly appreciate it. I want to thank Dr Hunt for putting me back together in 2002, Oakland, Highland Hospital. I came into ER with major broken bones and he did an amazing job. From time to time he crosses my mind. Just want to say Thank You! I want to be you when I grow up. I have a great deal of respect and admiration for you. Thank you for all the time you took to explain things to me and my sister as well as getting me on this path. I feel reassured, positive, and happy. I should actually be a "poster child" for you and your successful surgeries, an old 84 year old to come through as remarkably pain free as I have done, is pretty darn awesome! “Dr. Hunt went above and beyond to care for me during my recent stay at Cedars-Sinai. As a fellow nurse employee turned patient I was extremely grateful for the extraordinary care Dr. Hunt gave me. Having surgery was extremely stressful and he made a difficult situation a little easier. My husband and I are extremely grateful for all the care he has provided. We would not be where we are now without you. We are so thankful. Good season greeting and God Bless you at this holy time of year. May you feel the joyousness, the wonder and the delight of this season. I know that family is important to you, and that you will be spending the holidays with them. Enjoy your nephews to the fullest, as they will only be this age once, and I know how much they adore their uncle. May the peace of the holy season surround and engulf you, and may the love of the season last far into the new year. May god bless you at this holiday time and throughout the year to come. For over a year, not only have I been suffering from agonizing pain that comes and goes, but also I have been dealing with the emotional aspect of deciding a surgery. Only God knows how often I prayed for an answer, a relief and a healing. Today I feel so blessed and so happy to say that my prayers have been answered. God led me to the good hands of you, your brother and your staff for a great reason. Honestly speaking, on the first day I met you I felt like you were my angel. I felt inside me that you were the one to relief me of my pain. Funny to say this, but I felt like I was in the hands of my son. You were so kind to provide me your time, expertise and your clinical staff to take care of me for free! I really, really appreciate what you have done for me. I say thank you! Thank you and thank you. May God continue to bless your heart forever! P.S – I invite you and loved ones for a tour of my side of the globe when you visit Addis. I also want you to meet my family, especially my daughter who is in the final years of medical school in Addis. I would love for her to follow your footsteps. I think you are a great model for many youngsters like her. Today is the 4 year anniversary of the day that you fixed me up with an S1-L4 fusion. I will never forget the day as I got my body back and the ability to enjoy all the athletic things that keep me busy and happy – not to mention a life free of pain. Easy to take for granted when everything is going great – but pain free life is special when you have been plagued with a bad back. Every swing I take with a golf club or tennis racquet, or go cycling for hours – I enjoy all the more as there was a time I thought I would never be able to do any of these things again. I do take good care of your work! I exercise carefully, keep the weight down, stretch and do lots of core strengthening and have to admit there are not many 53 year olds that hang with me in the gym! Your commitment to excellence has certainly made a wonderful positive difference in my life and if you could hear my thoughts you would hear me thanking you all the time. My wife would be a close second! I hope that all is well in your life. During the Holiday Season more than ever, my thoughts turn gratefully to those who have made my progress possible. And in this spirit I say, simply but sincerely THANK YOU and Best Wishes for the Holiday Season and a Happy New Year! With the start of the holiday season, I am reminded of the years of previous holidays when I was in so much pain. There was no joy for me in trying to decorate & shop. This season, however, is so much better! I have been out shopping & looking forward to decorating for the holidays. Even the traffic doesn’t bother me! I want to thank you & the many people involved in my surgery for giving me the opportunity to have a quality of life I never expected to have. I’m so glad I chose to have the surgery done &, happy that I found you to do it! May I wish you & your family love, peace, & joy this holiday season. Thank you for helping my brother. You did an excellent job with his spine, God continue blessing you with your talent. I’m really appreciated for what you did for him, I went to see him yesterday and he is doing well. It was nice to knowing you and thank you for the link. If you need any help in the future let me know. I wanted to thank you and the wonderful resident who worked with me in looking at my “back” problem and determining that the deterioration of my left hip joint was the primary source of my pain and not my back. I saw my primary physician and a hip replacement specialist, Dr. Gilbert in Pasadena and they concurred with your diagnosis. Dr. Gilbert did a total hip replacement the day before Thanksgiving and I am now in recovery. It was easier for me to work with a doctor who was local to me. There is pain from the surgery but not the pain I had before. Thank you so much. If you did hip replacements, I would have signed up with you that day. Should I have problems in the future, I will have no hesitations to contact you in the future nor to refer people to you. I am so fortunate Danielle facilitated a referral to you. You changed the course of my life. My best to you and your family now and for the holidays. I feel truly blessed. As it is almost one year since my back surgery, I promised I would send you a picture of me from the Kansas State University Equestrian Team that I have attached. The KSU team has a shot at a national title during the upcoming Spring season. Thank you for everything you did to get me back in the saddle! Without you I wouldn’t be where I am today! Today is the 4th anniversary and still doing great. Just returned from Madrid so could not tell you sooner. You have made such a difference in my life. Thank you so much for the care and attention you gave me in regards to my chronic neck issues. The length of the time you spent with me during my clinic visit was unexpected, but certainly much appreciated. Thank you for your honesty & explanations in a language I could understand. Most importantly, thank you for your professionalism and expertise. I wish you all the best for continued success in your practice. Thank you all for your attention to my case, and for your patience with a mother’s determination to provide her son with “THE BEST”. B.N along with His Lioness Mom. Thank you for working overtime to clean up my mess of a back. I hope you’ll forgive me for flooding your office with referrals, but that’s what happen when you’re the best in your field. between seeing all my buddies with back issues, hope you can take the time to savor a little vino. Hi – Thanks for diagnosing my SI joint inflammation. It’s totally healed (it took a while) and I’m feeling ab fab again. I wanted to thank you for my visit today. I was seen for lower back pain. Your staff was friendly, efficient and professional. Steve was the RN taking my history and couldn’t have been better. You were on time, efficient, and friendly. You have one of the best bedside manners I have encountered. You did a great job of coming off kind and friendly and professional. I was suffering with a herniated disk when I was only 33 years old. I couldn’t even pick up my ten month old baby. At the end I couldn’t even walk or do anything because of the pain in my back and leg. My life was miserable until my best friend asked me to go see Dr. Gabriel Hunt. Thanks to the most amazing expert and kind doctor who got me back on my feet again. Thank you Dr. Hunt and your very kind team for giving me my young life back! Imagine a medical professional who allocates ample amount of time to see you, who listens, cares, and explains all of the treatment options in patient terms. Imagine a doctor committed to the highest level of care who incorporates those new techniques and methodologies best suited to your specific case. Imagine a doctor’s office where every member of the staff is fully committed to a vision of patient centered care- This is what I came across when I brought my husband in to see Dr Gabriel Hunt for a failed low back fusion… I could not ignore this review sheet for Dr Hunt- This is what every Doctor should practice!!! I woke up in the Emergency room in an excruciating back pain, not being able to move or feel my right leg. You could imagine the panic and anxiety that I was going through. I did not know what to expect. Could I walk again? Could I dance again? Will my fiancee leave me? All of these thoughts in my head came to a stop when your P.A. walked in to my room , held my hand and calmly explained what had happened and what was going to be done. ”We will take this one day at a time, and remember tough times don’t last, tough people do! ” And that is all I was concentrating on. Seeing you shortly after reassured me that I was indeed going to be fine… You fixed my broken back and my broken dreams that came with the trauma I sustained. I will forever be thankful to you for everything you have done for me from day one until now! Thank you Dr Hunt , THANK YOU! I love Dr Hunt. He operated on my back and few of my friends and family members all with excellent results! He is knowledgable and uses up to date technology with a minimally invasive techniques and a scar I can hardly see. Superb care! After seeing 2 surgeons for my condition who came in for 10 minutes and quickly told me I needed an extensive surgery to fix my low back, it came as a surprise when I came to see Dr Hunt who spent more time with me than the other two surgeons combined, moreover, he said I did not need surgery. He referred me to therapy, ordered injections then whats called a rhizotomy and after few months of this I feel fantastic. Turns out my problem was not my back at all it was whats called a Sacroiliac joint dysfunction. He also gave me a paper to read which was published by his assistant Gohar Abrahamyan who initially saw me. I highly recommend this Doctor to everyone who wants an honest opinion of what they really need. ….And for that you are a player!! !… I am back on the basketball court, doing what I do best! Thank you! Thank you for everything you did for me. Thank you for looking in on me on a daily basis. And above all, thank you for saving my life. I will never forget you. Thank you for your support and care throughout these last two years, you have saved me. Thank you Dr. Hunt for all of the extra care and attention you gave to my case. I cannot express how much it means to finally have this taken care of . Thank you all for your help, care and support. I am running again – pain free! You rock! I just wanted to thank you for taking the time to speak with me yesterday. It is so comforting to know that I can always implicitly trust your diagnoses. You are one hell of a doctor, and I am very lucky and privileged to be your patient. You are one of the finest doctors I have ever known, and I thank you for always treating me with respect, kindness and dignity. I was recently treated at Cedars-Sinai Medical Center for a burst vertebrae. I entered the hospital on August 21, 2012, via the emergency room. I had surgery the following day and spent a total of four and three nights in the hospital. The surgery was performed by Dr. Leonel Hunt. I believe you have a star in Dr. Hunt as he not only has the requisite skill to be one of the best in his field but also has exceptional interpersonal skills. He made my wife and I comfortable about the surgery, recovery and other aspects related thereto. I want to express my great appreciation for the team in the spine ward on the 8th floor of the south tower. They performed their duty exceptionally well, making a painful and tough situation much better. In particular, I want to mention the following nurses and aides ( I do not have their full names but I am sure you will be able to figure out the last names of each mentioned party); Lourdes, Nicole, Ester, and Demerius. I may be missing a few people but these four deserve to be recognized for their outstanding commitment, professionalism and compassion. Thank you so much for changing my decision to get surgery, it has changed my life! Physical therapy is the best thing that happened at home! I feel so much better and I owe it to you. Thanks for caring for what’s best for your patients. It’s been a challenging year, a year of learning & a year of growing. I think for both of us. After all we went through everything together. And I want to thank you from my heart for never leaving my side. That was the promise you’d made to me & you’ve kept it all this years. That brings me such a sense of security, safety & trust that goes beyond all bounds. You are a very special man. Not just a miracle-worker in the O.R, but also as a kind, generous & thoughtful gentle man. Words cannot begin to describe how much I appreciate you beyond how you’ve straightened me. A miracle in itself, also how much I appreciate your integrity, & morals. Straightening has changed my life, Dr. Hunt you have re-shaped my life & how it is lived. I am not in a w/c or bed bound, which I would have been by now had I not had the surgeries, I can face the world straight-on Becoming face to face w/the world has helped to re-shape my personality. I am much more confident, not afraid to speak up or out, share my opinion or just “Be” in the world. I feel not only like a new body but a new somebody as well, all for the growth & better! The words “thank you” Are ever so inadequate for what’s inside my heart. Just know that you have made a walking miracle out of me, both physically emotionally & spiritually. May the Lord bless you. I just wanted to say a BIG thank you for fixing my back and making it better. Also thank you for being such a loving and caring Dr. you mean a lot to me and you will always be in my heart. I feel more like a normal human being who can FINALLY breathe! That makes me soooooo happy. Hope this finds you well. Tonight when I took my dog out for a walk, I thought of you, as I so often do, when I am just strolling along like a normal person in a relatively pain free body. Thanks to you and the amazing operation you performed I have been off pain meds for over two years and, though still a bit chubby, achy and occasionally whiney, am doing well. I send you my deep thanks for the transformative blessing you gave me. With each & every visit I continue to be impressed with the quality of care. Following my spinal fusion surgery I am particularly grateful for the speed in which Dr. Hunt’s staff checks me into my appointment, routes me to x-ray and takes me to my designated room. No long waits! Many smiles to greet me. A Definite air of genuine care, and efficiency. I just passed my 2 year anniversary of surgery with you and wanted to say thank you again! On May 14, 2010 you fused S1- L4 on me and it turned my life around, by December of 2010, I was swinging a golf club, even though I know you would have cringed, but I did rehab it like a mad man, taking 9 weeks from work, going to PT religiously and establishing a core routine of stretching and strength that I never miss. I can now do anything. I recently played 4 rounds of golf in 3 days, I have taken up tennis and can do more now, with NO PAIN AT ALL EVER than when I was 30. I am 51 now and literally in about the best condition of my life overall. My only limitation is the one you warned me of – I do not get to my shoelaces quite as fast as when I was 20! I wake every morning my feet hit the ground, and I remember how I had to check and see how much it used to hurt and if I would be able to hold myself up right away, and assess the pain. Now I just get up and go. Not a day goes by that I do not recall our surgery day, my wife and I making jokes with you and the beginning of my healthy pain free life. I thank you every day for your skills and guidance. Removing chronic debilitating pain is a special skill – thanks for sharing it with me! It was great seeing you yesterday, and I am so very happy that my C4-T1 fusion and bone growth is on target. Thank you, thank you. I am so grateful for your expertise. I am blessed to have you as my surgeon. Blessings to you for your amazing gift as a surgeon. I will see you in a year’s time. I don’t know where to begin to express my deep gratitude and appreciation for how you stepped in today to help my mother and me. You are a brilliant doctor, and I have the utmost faith and confidence in you. You exemplify the true meaning of what the hippocratic oath stands for. You are a very kind, wonderful, caring, compassionate human being, and again, I thank you from the bottom of my heart. I will be forever grateful. Just a note to let you know I’m doing extremely well post op and wanted to thank you again for what was clearly another masterful surgery – and believe me, by now I’ve come to know the difference. Also, ahead of schedule, there is a noticeable reduction in nerve pain. Can’t thank you enough. DO NOT GO TO ANYONE ELSE!!! Suffering from degenerative disk disease for many years and undergoing two unsuccessful surgeries, I was referred to you by my sister-in-law. At that time, I could not stand stationary for more than three minutes without support or shifting my entire body weight to my right leg. Your professional and kind demeanor was comforting; but, more importantly, your clear explanation of what was required for me to finally become pain-free and resume my normal physical activities was the answer to my prayers. Although you candidly advised me, immediately following the planned surgery, you would not be my favorite person, I nevertheless had no question you were there to make things right. It was not an easy recovery, at age 61, but once I “turned the corner”, I knew that my life was going to return to normal. In fact, eight weeks post-surgery, I celebrated my wedding anniversary in New York City, walking the streets of Manhattan during the holiday season. In April, 2010, just six months after the fusion, I checked off my Bucket List a solo, motorcycle round-trip adventure across the United States, traveling 7,000 miles in 29 days. There was never a day I had any problem with my back. I have learned to bend differently to tie my shoes, just as you told me, and there are those occasional days when I do get some soreness/stiffness but, by and large, I am living an active life and enjoying it to the fullest. Had it not been for you, sir, I am not sure what the future may have held for me. You are a master, an artist and a genuinely gifted human being. Neither I nor my family can ever thank you enough for all that you have done for us. Where to begin? Several years ago I lifted something a bit too heavy and POP – out went by lower back. After going through PT and seeing a Chiropractor, the end conclusion was that I needed a laminectomy. Upon awakening from the procedure, I had felt worse that before I went in. It took about 5-6 weeks to figure out I needed a revision, this time hoping the results will be as they were expected to be the first time. No such luck. Following two failed attempts, I was told there was nothing that could be done to help me. I was shoved off from one pain clinic to the next, having a variety of medications pumped through my system, with most being a failure in helping me with my condition. I went through epidurals, spinal injections and even underwent the trial for a Spine Stimulator. Nothing was helping me and not only was my body failing physically, I was being failed mentally and emotionally as well. I was referred to a Psychologist, who then also wanted me to see a Psychiatrist, who also thought it was imperative that I go through antidepressant medication therapy..and very high doses of it. All to no avail. I couldn't explain to all of these medical professionals that a pill is not going to help what I endure on a daily basis. My pain was so high that I was chipping away my teeth from grinding them on a daily basis. I have two young children, my youngest only being 4 months old when this all begin, and they only knew Mommy as “broken Mommy”. My oldest, now 6yo, was last held by me 4 years ago. My youngest had to learn how to climb onto and from everything in order for myself to avoid any lifting. My marriage was held together by belief that we will not give up. Every day, if it wasn't me then it was my husband reading and researching all information available. I confided in my therapists, in my pain doctors, in my primary care doctor that although I do feel like giving up on a daily basis – I know there has to be more out there. There is no way that I could be left in this condition and no one out there can help me. People are getting face transplants, but I cant get my back fixed? Not right. Since winters are brutal in NY, it was October of 2009 and I, again, was preparing for a painful winter which dubs as a very deep depression. Which led me to Dr. Leonel Hunt. I wanted to find the very best doctor is all of America. I realized that I was too young to throw the towel in and it was time to do something, whatever it took, to get my life back, which in return would give my children their lives back as well as my husband. We needed to be that unit we once were. I confided in my husband that I was going to do whatever it takes, and he supported me 100%. Whether he knew at that time that we were going to turn our lives upside down in the next 4 months or not, it didn’t matter. He knew I was coming to and end with my pain tolerance. I refused to live my life on a 24 medication regimen. I researched and researched and the one common denominator that kept coming up with Dr. L. Hunt. I gathered all the information I could, and called a family meeting. As I presented the information, informing my family that I think I may have found someone that could possibly help me – my family was ecstatic. Then I informed them that it would require for me to take the family and move across the country. Not so ecstatic anymore. It seemed so far fetched, as my pain was so high that I coudln't drive an hour away to see family, but I was proposing going to California for a consultation. I was willing to endure anything at this point, if it meant an end to my misery, then so be it. A month later, in November 09, I booked my flight to Los Angeles and booked my appointment with Dr. L. Hunt. I think I was more nervous for this appointment than I was on my wedding day. After all, this was either going to make me or break me. The staff was wonderful, very welcoming, very warm. However, I was fighting back a flood of tears because up until this point, there was not a single doctor appointment in regards to my spine that ended well. They all ended horribly with myself sobbing all the way home. Needless to say, emotions were high. But one thing that stuck out right from the beginning, was that I didn't have the urge to cry. I met with the nurse, explained my history, and then waited for Dr. Hunt to enter the room. No tears. He explained to me what he saw on my films and read in my medical reports, and he didn't waiver. He was so professional about my situation, so empathetic, that I suddenly felt that I had a team mate rather than another opponent. I felt that this was the first person that I am not feeling the need to battle to help me. He was game and he was more confident than I ever encountered up until this point. No wonder the tears were not flowing, there was no need for them. He was on my side, for once. He wanted to help me and he felt confident in this decision. He discussed my options with me – my options being two; 1. Do Nothing OR 2. Proceed with a Fusion. Upon returning to NY, I had a lot to decide on but the easiest part of it was that I finally felt like I had a solution to my many years of agony. There was an end in site and I was going to get to it. Within a week, our house was on the market, I notified my entire circle of family and friends and my husband began his search for employment as I searched for a place to live. Within 8 weeks, my family of four was moved to San Diego. My husband secured a job, I secured a lease and I finally felt positive about our future. Was it hard? Absolutely. Worth it – absolutely! During this entire time, Dr. L. Hunt’s staff kept in contact and were there for me if I needed any other assistance before undergoing the surgery. In May, 2010, I went in for a 2 level lumbar fusion. The care I received was beyond impeccable. Dr. L. Hunt’s bedside manner is award winning. His confidence made me feel so comfortable and made this entire process worth every moment of it. Not a stone left unturned, not a question left lingering – I truly felt like I was the only patient he had. Prior to surgery, he was there, and upon awakening from surgery, he was there. He came every day to check on me while I was in the hospital and he made sure my recovery was right on cue. I’m not quite 6 months since my procedure, but I am feeling a world of difference. I feel so much stronger, and more efficient. I would have never been this well along had I not pursued the care of Dr. Hunt. He truly is amazing, and life altering for not only myself, but my entire family. We are forever grateful to him. I have documented my entire journey, and have had over 10,000 hits, all with positive and remarkable feedback from across the states, all the way to Taiwan!! I am very very grateful for the medical knowledge and professionalism of the entire Hunt Staff. I would be typing for days if I were to write down all that has changed since I have met Dr. Hunt. All in all – THANK YOU!! I came in at the end of January to have you check a muscle spasm along with my spine. My orthopedist and I had asked my radiologist to triple check my MRI, since the spasm had a funky feel about it. The radiologist concluded that there was no mass or tumor and therefore the spot in question must just be in spasm. I came to you for a second opinion. You looked at the very same MRI and immediately asked me whether anyone had mentioned anything about my kidneys. They hadn’t, and you showed me what looked to be a cyst in the right kidney. Even I could see what you were questioning. The right kidney was visually different then the left. I have since been diagnosed with renal cell carcinoma. The tumor has pretty much taken over, so I’m having surgery to remove my kidney on March 10th. I probably can’t express in words how amazing and wonderful you are, but I sure as hell will try! I can’t believe you spotted it. I was a brand new patient for you, and you could have analyzed solely the spot in question and dismissed me just like the radiologist. But you took the time and properly analyzed my imaging studies and suffice to say could have very well saved my life. So fatr the cancer is contained within the kidney, so I should be good after surgery. But I need you to know that without you, this may have never been detected possibly until it was metastatic, I got really sick and my survival rate decreased tenfold. Thank you SO much for your quality care and I hope you realize you’ve impacted and changed my life forever. Thank you thank you from the bottom of my one good kidney. I had the privilege to see the x-ray after surgery. It was like a piece of art, 2 totally aligned discs in my throat with 8 screws. I was so impressed by your precision and at the same time so real happy to have met you. You are living your mission to heal the needy in this lifetime. What a blessing to you and your brother. I told your story to my 84 year old mother who has Alzheimer’s and she was so touched that she cried. I am grateful that you were sent on my path, that I can now help other friends in need by sending them to you. A lot of physicians can take a lesson from Dr. Hunt. His office and bedside manners are sincere and he obviously cares very much about his patients. Never once have I felt rushed through an examination and the few times I have had questions and called them in, the calls were always returned. Dr. Hunt takes the time to explain any and all procedures while giving the patient a chance to decipher what in fact is going on and does not leave the patient feeling flustered and uncertain–in short, you get an thorough education–something that is necessary in the long run so you know how to take care of yourself both before and after your procedure. I recommend Dr. Hunt to anyone who may need his help; believe me, you will feel better from the time you meet him until–and after–the time you are healed. G-d bless you Dr. Hunt and thank you for everything! YOUR work has been great, better than I could have hoped for. I’m off all meds and am doing daily strengthening exercises and weekly physical therapy. Thank YOU!!! Thank you for giving me back my husband and life. Have I told you lately that I adore you?! And that I thank you every day for being my guardian angel throughout my little go ’round in Feb-Mar of this year. It meant so much to me that you hovered carefully on the perimeter and popped into my hospital room often enough to keep me smiling and full of faith that I would get out of my pickle. That I certainly did, and am feeling totally well these days. Here’s wishing you a wonderful New Year, full of fresh beginnings and good fortune! It’s hard to express how grateful I am that you were in the area when I needed you. You came in the room and felt instantly at ease and confident that you knew just how to fix me. I was right! Thank you SOO much! I could start this card with cliché words like – “Words can not describe how grateful we are Blah, Blah, Blah” or I could just give you some Real Raw Emotion. Not only are you the hottest and coolest surgeon but you did an AMAZING job on my baby, and YES we are VERY grateful!!!!! Every inch of my heart thanks you and your brother! Wishing you and your family many blessings in 2010 and beyond. It has been 6 weeks since you and your brother performed my T-11/T-12 discectomy. I am up and riding my bike and doing all the things I love to do again. You and Gabriel fixed me up physically and even more importantly mentally as I no longer have to live with the fear of having a compressed spinal cord hanging over my head any longer. You two guys were absolutely awesome in every way. I was soo nervous from what another Dr. told me. What can I say, he was wrong and you guys showed me, with compassion , the facts and not fear tactics. Thank you for fixing my problematic back and ever-spasming leg by performing the microdiscectomy on me this past September. Working in an emergency room at a large hospital, I can now walk spasm-free and do my job efficiently without having to pause and wait for the pain to subside. I still have some residual left leg pain but I realize nerves need time to heal and I’m a patient gal. The professionalism and humor with which you supported me was priceless. I appreciate your tremendous ability to communicate and most of all your warmth and compassion with which you handled me as a patient. Your office is the most efficient and friendly office I’ve EVER encountered and they are absolutely wonderful people. Thank you again for improving the quality of my life! It’s been now 8 weeks since surgery and in the past three weeks I have been walking more than a mile a day climbing some very steep stairs and sitting on planes for up to 8 hours at a stretch. All in all I feel really good. I have no pain other than minor aches and fatigue, especially in my left leg that has not really done much prior to surgery. I still have numbness and occasionally lilt to one side, but I am getting through airports at speeds approaching my pre-stenosis diagnosis. I just wanted to take some time and say than you for putting my quality of life on a very positive path towards recovery. I wanted to let you know that I am finally able to do my show again and will be performing for two nights. It’s because of your work that I am able to once again do this. Thank you for making my life more livable! My three boys (and wife) thank you for giving them there dad back. I finally feel hope for the first time in a very long time. Thank you for sharing your talent and brilliance with me! How do you express gratitude to the person who has lifted you from a wheelchair? Thanks, sounds like and empty word yet I don’t know a better one. The next morning after surgery (5 days ago) a good part of my pain was gone. I know I still have to deal with other problems, but you have made a tremendous difference. I have not much to offer just sincere gratitude and humble prayers. I just wanted to say thank you for your knowledge and professionalism. I appreciate your candor about my husband’s situation and your willingness to explain things to us, so we have a better understanding of everything. Plus you made J. walk again! WOW! I realized that after I left my last appointment with you that I forgot to thank you for the wonderful care you provided for me while I was in the hospital. It was very reassuring to have you stop by in the morning and then again each evening to see how things were going and to answer my very long list of questions. I also wanted to tell you that I sincerely appreciate your willingness to answer all my questions once I returned home. I know very few doctors who would be willing to do that. Thank you for going the extra mile. Your name has come up in numerous conversations during our trip. M.A. and I are “cruising” and visiting Spain, France, Greece, Turkey and Italy. And I am only 8 months post op and doing fabulously!! Thank you again for making this trip possible for me to see and enjoy this part of our world! See you in September! I can never express my gratitude enough for your saving my life. You are a miracle worker. I want to let you know how much I appreciate you. Before I came to you I was miserable! I could hardly walk, drive … NO LIFE!!! UGH!! After discussing my problem to you, I felt confident that everything would turn out ok, and it did. Now I’ve got my hair down and heals on! I am blessed you were my doctor. Thank you for bettering my life. Thank you so much for your excellent care. You made my son feel normal again, relieved from pain. It is a blessing to have you for his doctor. You are highly recommended! For you I am one of many patients you have had to deal with this year, but for me, you were the only surgeon that’s been around my spine How truly fortunate I am that although I was one of may, you have treated me as if I was the only one! I can’t thank you enough for your expertise, treatment, support, sharing of your incredible brilliance and personable approach. What can I say … You ROCK! I can’t begin to thank you for your care, compassion and great skill! You were my savior at a time when I had no idea what would happen next. There are no words that can express my gratitude. This holiday season I have so much to be thankful for. Near the top if that list is that guardian angels put me in your hands. It’s amazing that we found you … I am so grateful! I have always felt secure in your care and your bedside manner (the person you are) is why. Thank you, Dr. Hunt, for your care and for being you! I am not sure if you really understand how thankful I am for the surgery you performed on me. I know my issues were probably minor in comparison to other patients you see; however, to me they seemed major. I’m not sure if I told you, but my father had the same surgery 5 years ago and then he had a fusion 3 years ago and he still has numbness and pain – he wants me to make him a dependent on my insurance so he can come see you. I’m sleeping sound for the first time in months. I’m comfortable and so much happier. Thank you so much! How are you doing? I hope that you are well. Thank you for the referral to Dr. B. I went and had an MRI and x-rays done. Dr. B. said that the fusion look fine and there was no damage. He said you did the same procedure he would have done. He sent me for 8 weeks of physical therapy. It is going well and I am feeling better. Dr. B. seemed knowledgeable. If I have anymore troubles with my back I would fly to wherever you are if I need to have any work done. He in no way compares to your professionalism, politeness, and overall good feeling that I am in the best hands possible. The bar you set is very high. I miss you and wish I still saw you on a regular basis. You are a wonderful man and a great surgeon. This is a note of thanks. It’s been a little over 7 months since you and your team worked on me to correct my spinal stenosis. I have completely recovered, except for very minor numbness in my feet, just as you said. I have no adverse effects of any kind, and I haven’t since a few weeks after my surgery. I can do everything now that I could before having nerve issues. The way I was deteriorating prior to seeing you causes me to believe that I would soon be confined to a wheelchair. Instead, I am again living a very active lifestyle. I saw three other spinal surgeons prior to choosing you and each of you recommended somewhat a different procedure of which yours was the least invasive. Thanks for explaining your approach relative to the others, and why it was the correct approach for my condition. Your confidence and obvious knowledge made me fell comfortable about proceeding with the surgery. I think often about how extremely fortunate I was that I found a surgeon as outstanding as you. You have changed my life in a very positive way. Thank you very much, and please thank your brother and your entire team. What you did for me two weeks ago is like a miracle. I am back home now in Montana enjoying walking freely and easily. I can’t begin to tell you how much it means to me, my husband, my children and grandchildren. I will continue with the Physical Therapy, I am also going to work with a trainer to help get the core muscles back in shape. I am so excited. Each day is wonderful with hope and no pain. Thank you so much for your time and caring. My name is James. For 8 years I had chronic back trouble that would come and go. After the third major flare up I promised myself I would get surgery if it ever flared up again because there was just no way I was going to live the rest of my life like that. In Autumn of 2004 my back flared up VERY BADLY incapacitating me yet again. I immediately began to look for the very best back surgeon in the city of Los Angeles. Let me take a moment to tell you something important about myself. I have been doing martial arts since the age of 7, and in 2004 I was 41. My all time favorite martial art is called Capoeira from Brazil. It’s a combination of high kicks, fast non-stop movement, and gymnastics. It is a sport that uses Every Muscle Of Your Body, it is an amazing Cardio workout, and it pushes even the best athletes to their limits. To me it is also addictive – if you have heard of “runner’s high” or “surfer’s high” I can tell you that in Capoeira I have achieved that same state that only comes from pushing your body very hard in something you love doing. I have described Capoeira as one of my three favorite things in life. Since my back went out in 1996 I could barely play at the very lightest levels of Capoeira and that was only when I was having a “good phase” with my back. I went through with the surgery in March of 2005, but not before Dr. Hunt helped me achieve a different sort of goal – finding the best Personal Trainer in Los Angeles who IN PARTICULAR understood my condition and could help my strengthen every muscle I knew I was going to need for the best post-op recovery. For two months prior to my surgery I trained with Rene Abreu who taught me all about my Core Muscles and Core Training. By the time surgery came I was already in better Core condition than I had ever been at any time in my life. The surgery went perfectly, and as soon as I was able I began Physical Therapy with Physical Therapy Specialists. Eventually my main therapist became a woman named Karen Hu. I was under her careful eye until I was “graduated” towards the end of August 2005, after which I began receiving acupuncture treatments from Yancy at PT Specialists until the end of 2005. By September 1st 2005 I began training with Rene again, starting off very slowly, and I have been training with him ever since. the Master Instructor of the Capoeira School where I train SKIPPED ME UP TWO RANKS. I laugh as I write this because even I was completely surprised and in awe by this. I love Capoeira and I do it because I love it – I have trained in more than half a dozen other martial arts and I always come back to Capoeira – but I still did expect to go up even one rank let alone two. Please if you are reading this and have any doubts about your ability to recover after back surgery take my words to heart: Your only limits will be what you believe you can do. With Rene I trained as best as I possibly could before the surgery, given the obvious limitations. With Physical Therapy Specialists I did their exercises RELIGIOUSLY. Yes, I had good days and I had bad days, but I summoned up every drop of stubbornness I could find and I DEMANDED of myself that there was no room for laziness in my recovery process. Some days everything would be achy and I would want to flake off – I did not let myself do so. I had a very clear dream, and that was to be back playing freely in the Capoeira circle, and NOTHING was going to stop me from getting there. Call it stubbornness, call it bull-headedness, call it determination, call it what you want. I had no intention of being stupid about it and trying something I was not capable of, and I made sure that every move forward in my training program was cleared with Rene, with my Physical Therapy, and with Dr. Hunt. I listened to their instructions and I kept my sights on my ultimate goal. Their positive encouragement and sheer expertise was a mountain of blessings in my life. With Rene after being released from Physical Therapy I listened to his every word on fitness, on diet, on strength training, and on Core Training. These days Rene spends extra time trying to find new ways to challenge my Core Strength because of how far I have come. Take it to heart as well that your Core Strengthening will be one of the most important things you can do to get your life back. I wish I had been taught this stuff in grade school! Back surgery is FAR from the end of your life – I am here to tell you it can be the beginning of your new dreams. It was a genuine pleasure meeting you today. You are a lovely person and, thanks to you, I have decided to take the plunge and go ahead with my plans to move. I have wanted to attend culinary school since I was in my 20′s and I thought for sure my back situation would prevent me. I was hoping to find a doctor just like you, to reassure me that my condition wouldn’t prevent me from pursuing my dream. Thanks again for everything. It is a really good feeling to know there is a doctor out there who understands my condition and is so positive about my recovery. You made my day! I truly do not know where to start by saying a heartfelt “thank you” for having a long distance conversation with me about my up-coming back surgery. First, I cannot believe of such a true concern you have for someone you have never met on the face of this earth, and second, I also feel that perhaps someday we shall meet! With my faith in “God” nothing is impossible. I wish and pray you have an extremely successful practice as a doctor, a long healthy life, and much happiness! And, Oh yes, may “Guardian Angels” follow you constantly. You already an Angel to me. Thank you very much for your excellent care and help with my 2 surgeries (7/13/04 & 7/20/04) at Sharp Memorial Hospital. You are wonderful & may you continue to be as caring as I saw & felt with my surgeries. I wish you well & the best in L.A. We shall miss you! You are without a doubt the most responsive physician I have had in my entire life. I can’t tell you how great it is to know that you actually care enough about your patients to follow through so meticulously. At a minimum, it gives me peace of mind and I totally appreciate everything you do for me. I am so grateful for your insight and guidance regarding my case. After months of conflicting information without a clear answer, I left your office feeling so encouraged and empowered with the appropriate clinical information to make decisions regarding my treatment/return to work plan. Thank you so much!! You made my day. Also, if your foundation ever needs nurses for future medical mission trips, please keep me in mind!